Tainan's old fire house stands out on Minsheng Circle. The tower was built first. 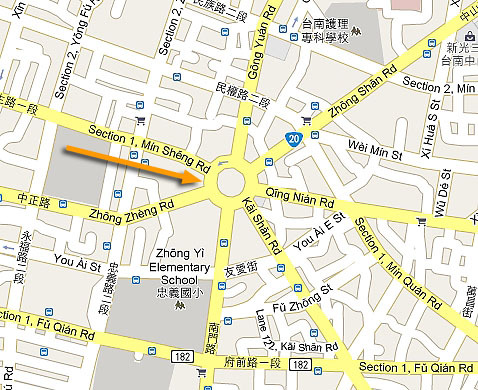 I’ve always liked the old fire station across from Minsheng Green Park. In fact, it is second only to the Tainan Railway Station as my favorite city services building in Tainan. Perhaps I like them both so much because they are so similar. They were both built during the same decade of the late Japanese period using a similar art deco architectural design. You can even see the same round windows set into both buildings. The fire station, however, has that great towering presence, and it’s hard not to love that giant 119 painted across the front to remind you of Taiwan’s emergency phone number. The structure you see now was built in two stages. In 1930, the city government built the central tower as a fire observation post. 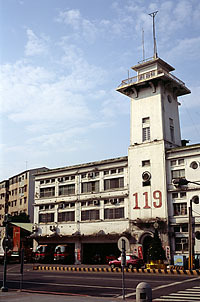 It stood as an independent structure – the tallest tower in Tainan at the time – until 1937 when the offices were built on either side as an expansion. While I always think of this building as a fire station, it was actually built as the joint government offices for the fire and police departments. Today the building is shared by a working fire department and a police unit dealing with juvenile delinquency. The Fire Brigade is right across from the old Tainan Prefecture Hall (National Museum of Taiwan Literature), and not far from the historic Tainan Police Headquarters.